Small cap equities had a strong showing in the second quarter following a volatile first quarter, with the Russell 2000 Index up 7.8% in the quarter and 7.7% so far in 2018. After lagging large cap stocks last year (+14.6% vs +21.8% for the S&P 500 in 2017), the tables have turned with small caps outperforming strongly this year (+7.7% vs +2.7% for the S&P 500). The smallest companies generally did better in the second quarter. The Russell Microcap Index finished with a 10.0% total return compared to 7.8% for the Russell 2000 and 3.6% for the Russell 1000. Small cap value stocks slightly outperformed growth (8.3% vs 7.2%) but remain well behind in the year-to-date period (5.5% vs 9.7%). Over the last five years, growth stocks maintain a dramatic lead over value (+90% vs +70% for the Russell 2000 style indexes). With much of the investment world focused on tariffs and trade, domestically-oriented small caps have clearly benefited from a relatively lower risk profile on this front. According to Bloomberg LP, the average Russell 2000 company derives 90% of its sales domestically. While we have seen some knock-on effects of trade tensions among our portfolio companies, largely related to supply chains and material costs, they are not widespread. What is more, domestic small caps seem to be benefiting from accelerating economic growth and a reduced tax burden. The net effect seems to be increased confidence among small cap investors and company managers, the likes of which we have not seen during this economic recovery. The Punch Small Cap Strategy produced an 8.5% total return in the second quarter, besting its benchmark by 73 basis points. On a year-to-date basis, the Punch Small Cap Strategy is up 11.1%, which is 344 basis points ahead of the benchmark. With a portfolio of 49 names and 97.8% active share, our portfolio looks meaningfully different than the benchmark index today and we would expect performance to deviate in any given quarter. We continue to be overweight areas of the market that are more cyclical and positively correlated to higher interest rates, including consumer discretionary (10.5% overweight), financials (4.9%), and industrials (3.2%), while maintaining a significant underweight to healthcare (11.5% underweight). We have no exposure to the real estate and utility sectors and ended the quarter with approximately 3% cash. 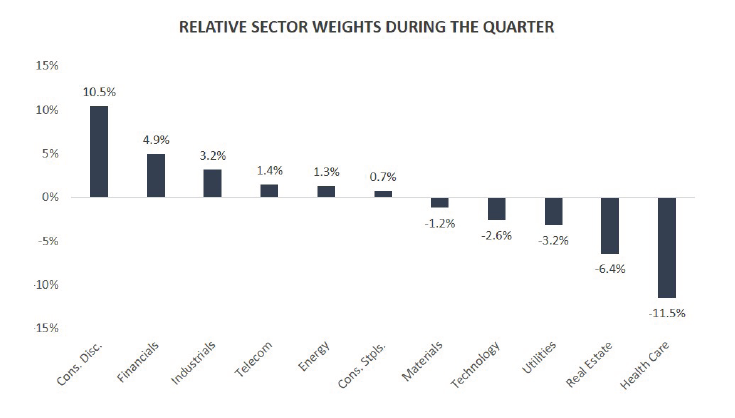 The big story in the quarter was the outperformance of the energy sector, which was by far the best performing group (+20%) after being the worst-performing group last quarter. Despite this bounce, energy remains an under-weighted and, we believe, under-appreciated asset class. Energy is the lone Russell 2000 sector with a negative return over the last three years (-30%), and the fallout from the energy downturn of 2014-15 continues to reverberate. We are overweight this group today and added two new energy companies to the portfolio in the second quarter. The largest detractor from performance in the second quarter for the Punch Small Cap strategy was Pzena Investment Management (PZN, $600mn market cap), a value-oriented money manager based in New York with $38 billion in assets under management. Our ownership of Pzena goes back nearly a decade to mid-2009 and we have come to know the company and its management quite well over that time as we are currently the largest holder of the company’s Class A stock (the class represents approximately 25.6% of the total shares outstanding). Rich Pzena, the company’s founder and namesake, owns 47% of the firm, largely through Class B shares, and insiders own nearly three-quarters of the total shares outstanding. As value-oriented investors ourselves, we have a great deal of respect for Pzena’s brand of deep value investing, which seeks out unloved companies that are temporarily underperforming their normalized earnings power. We think the core philosophy of the firm is unique, contrarian, and can generate strong long-term results. However, value investing has been neither popular nor relatively profitable in the current market cycle, and capital flows into Pzena funds and accounts have been inconsistent over the past few years. In the first and second quarters in 2018, net client flows were negative, and fees compressed slightly compared to the year-ago period. Despite these headwinds, the firm has been busy launching new strategies, investing in sales and marketing, and expanding its already impressive operating margins. Rich and his team are actively building on their brand and reputation as a well-known deep value investor. What is more, the stock remains in “deep value” territory itself, with a 10% free cash flow yield, 11x p/e, and 5.7% dividend yield. These types of valuations are difficult to find in today’s market, especially for a firm that we believe can grow and produce competitive returns on capital over time. We think that when the “growth versus value” cycle eventually shifts, Pzena’s strategies will benefit and may attract stronger client inflows. The second largest detractor from performance in the quarter was LendingTree Inc. (TREE, $3bn market cap), a stock that we have owned since 2014. LendingTree today is larger and more followed (14 sell-side analysts) than a typical stock in our portfolio, although this has not always been the case. We have trimmed the position four times in four years, most recently in January, and today it is approximately a 1% position in the portfolio. LendingTree’s primary business is selling customer leads to lenders for a variety of loan products, including mortgages, personal loans, credit cards, and student loans. Until recently, mortgage lending was the company’s largest end-market, but with a rise in interest rates this year, refinancing activity has tailed off and mortgages have declined for the first time in a long while. The company’s CEO Doug Lebda has been hard at work the last few years diversifying the business away from pure mortgage lending, both organically and through M&A, and as competition among both traditional and non-traditional lenders for borrower customers remains intense, we believe that Lending Tree should be able to maintain its growth trajectory and margin profile for the foreseeable future given its brand recognition and ability to deliver much-needed customer leads quickly and efficiently. While the valuation of LendingTree stock is above-average today (3x revenues and 15x ebitda on an enterprise value basis for 2019), we find it interesting that the company’s largest shareholder, Liberty Media (27% owner) recently purchased nearly $50mn worth of stock and put in place a 10b5-1 automatic purchase plan to acquire more shares. A notable underperformer in the second quarter was Alamo Group (ALG, $1.1bn market cap), a manufacturer of heavy duty mowers, street sweepers, vacuum trucks, and snowplows. We like the company’s focus on leadership positions in niche product categories in industrial and agriculture markets as well as its focused acquisition and integration strategy. CEO Ron Robinson has been at the helm for nearly 20 years and we believe he has an intimate knowledge of his end markets and a well-worn playbook for finding and integrating tuck-in acquisitions with strong brands and loyal customers. Alamo, based in Seguin, Texas, is one of a handful of companies in the Punch Small Cap Strategy that has been impacted by trade tensions this year, and we believe that its underperformance is largely related to these concerns. While end market demand and organic growth have been accelerating in all three of the company’s reported segments (agricultural, industrial, Europe), supply chain inefficiencies and input cost inflation have clouded the near-term outlook for the company. Wait times for some critical components have doubled, and steel costs are up meaningfully. We believe that the company is reacting quickly to this difficult environment and increasing prices to offset these pressures (gross margins increased last quarter), but it is too soon to declare victory. Products with strong brands and market share usually lend themselves to price increases that stick, and we are watching carefully how well management can pull these and other levers to overcome trade-related cost issues. On the positive side, Alamo’s effective tax rate dropped from 35% to 26% last quarter, and the company was able to repatriate a meaningful amount of cash from overseas. We added to the position following the disappointing first quarter earnings announcement. The largest contributor to performance for the second quarter in a row was Etsy Inc. (ETSY, $5bn market cap), an e-commerce marketplace for handmade goods that is in some ways the “anti-Amazon,” helping small business people sell unique goods online. We have spoken in detail about the uniqueness of Etsy’s platform and the ongoing turnaround under new CEO Josh Silverman and CFO Rachel Glaser in previous commentaries. In the second quarter, the company announced that it was raising selling fees from 3.5% to 5% and re-investing in tools and marketing to strengthen the marketplace, in addition to reporting strong quarterly earnings results. We continue to believe that Etsy is a unique platform with a strong competitive position, and a business model with significant operating leverage. While its valuation is elevated today (7x sales and 28x ebitda on an enterprise value basis for 2019), we continue to believe that new management has not yet fully effected their turnaround at the company and that there is significant strategic value in the business. INTL FC Stone (INTL, $1bn market cap) was a notable contributor to performance in the second quarter and was our largest position at June 30, with a 5.0% weighting. INTL is a diversified financial services firm with operations in commodities, forex, and international trading, exchange clearing, and payment solutions, and its customers are largely commercial and agricultural institutions that use INTL’s services for risk management. The company is the top market maker in OTC securities in the U.S. and has nearly $3bn in total assets. INTL is run by its long-time CEO Sean O’Connor who, since 2002, has compounded book value per share by 17.7% annually. The INTL business model tends to do well when two things happen: first, when market volatility picks up (trading volumes increase, and spreads widen), and second, when interest rates rise (increasing the amount the company earns on its $2bn float). Both have happened this year, and as a result INTL reported an adjusted 20% return on equity for both the first and second quarter of the year, above its 15% target. We had the chance to catch up with Mr. O’Connor at the company’s midtown Manhattan offices in April and came away impressed with the scale of the business he has built over the last fifteen years and the long-term vision he has for INTL. The outlook for the company’s cross-border payments business is particularly strong and we believe its value is not fully reflected in the company’s market valuation today. Top five holding Capital Southwest Corp (CSWC, $300mn market cap) had several significant announcements in the quarter, including an increase in its regular dividend, the payment of a special dividend, and the announcement of a supplemental quarterly dividend to be paid for the foreseeable future. With these announcements, the company will double its dividend yield to over 10% and go from paying a below-average dividend to an above-average one among its publicly-traded peers. Hopefully, this should translate into increased investor awareness and a higher valuation for the company. As a business development company (BDC) that has been slowly deploying its capital over the past two years, we have been impressed with the underwriting track record of management, its ability to increase book value per share while paying a growing dividend, and a judicious approach to leverage. We believe that management is thoughtful, appropriately conservative, and well-aligned with shareholders. Most internally-managed BDCs trade at premiums to book values, but at June 30th Capital Southwest continued to trade at a discount. We added three new positions and exited two in the second quarter, ending with 49 total positions in the Punch Small Cap Strategy. Our first new position was Columbus McKinnon (CMCO, $1 billion market cap), a specialty manufacturer of industrial cranes and hoists. Though it is a global player, the company has the leading market share position in the United States in this niche industry and is well-known for the quality and durability of its products. Notably, the company’s products are not directly tied to the capital equipment cycle but rather are maintenance-type purchases for most customers, which softens the cyclicality of the business and creates an attractive revenue stream of high-margin parts and components. We have gotten to know the management team over the last 18 months as the company was first held in the Punch Micro Cap Strategy and is now of a size that it can be added to the Punch Small Cap Strategy. The big opportunity in front of Columbus McKinnon today is to transition from a traditional industrial products company to a technology-focused industrial automation company by integrating electronics into hoists and cranes for automation, remote monitoring, analytics, and safety. After having successfully acquired and integrated several large competitors with more advanced “smart hoist” technology, a new CEO is driving the company toward higher-value automation solutions with the stated goal of 15-20% earnings per share growth over the next three years. The company has five sell-side analysts covering it today, three of which have initiated coverage in the past year, and we believe that investors are largely unaware of the transformation going on at the company, and that the aggressive growth and profitability targets by management have yet to be rewarded in the stock valuation. The second and third new positions in the quarter are related. As generalists, we are hesitant to invest in companies that are highly dependent upon the price of any commodity. However, we are attracted to areas that are hated and forgotten; that appears to be the case with the energy sector today. The price of West Texas Intermediate (WTI) crude oil peaked at $110/barrel (bbl) in 2014, bottomed in Q1 2016 in the mid-$20s/barrel and has since recovered to $74/bbl as of June 2018. Contrast that to the Russell 2000 energy index which remains 66% below its 2014 high. The Russell 2000 energy sector has returned -28% and -49% over the last three- and five-years, respectively, compared to the index that is up 37% and 80% over the same period, making it the worst performing sector and the only one to have negative returns. We have taken a basket approach to the sector meaning we intend to spread the strategy’s exposure to energy across several names, having slightly less weighting to each individually, but in aggregate the position is comparable to any other holding. The two positions added in the quarter both trade at below market valuation multiples and both will have mid-single digit P/E ratios by 2020 if earnings expectations can be met. The setup appears to us as an attractive risk/reward. Our second new position in the quarter was Ring Energy (REI, $762 million market cap). Ring Energy is an oil-focused exploration & production (E&P) company. Its wells are in the Permian and Delaware basins in Texas, but in areas that don’t have the prolific production that has made the region famous. Due to the shallow nature of where the oil is located underground, Ring Energy’s costs are also less. It appears to be a smart strategy as the return on investment is significantly higher than most E&P companies. Because the company does not report the enormous production per well figures that the Permian basin is known for, it has not attracted as much investor attention as some of its larger peers. Ring Energy has a seasoned management team with a proven track record in the region and is aligned with shareholders given the high insider ownership. We were also attracted to Ring Energy because of its debt-free balance sheet and reputation in the industry. The debt-free balance sheet provides the downside protection we like to have in a volatile industry like E&P. If the price of oil decreases like it did between 2014-2016, Ring Energy can “live to fight another day” given it does not have any large obligations coming due at an inopportune time. Ring Energy’s earnings have started to positively inflect and based on expectations for 2018-2020 the company appears significantly undervalued. The third addition in the quarter was Select Energy Services (WTTR, $1.5 billion market cap). Select Energy Services operates in a unique niche in the energy services sector; it supplies, transports, and disposes of the water needed by E&P companies during the hydraulic fractionation process. Companies are using more and more proppants (sand, chemicals, etc.) within each well and the amount of water needed per well goes up proportionately. As a result, the demand for Select Energy Services’ offerings goes up even if the number of wells drilled remains flat or declines. Water services is an attractive niche in the energy sector because water rights are more difficult to obtain than building additional equipment which can create excess capacity and pressure margins. In addition, Select Energy Services benefits from economies of scale. In 2017, it acquired another leading company in the space, making the combined company the dominant player. It has the infrastructure necessary to be the water solutions expert for many of the US’ leading E&P companies and has made itself a critical company in the success of US’ shale revolution. Select Energy Services has a conservative balance sheet and is attractively priced. As its scale, infrastructure and water rights advantages become understood we expect the market will reward it with a higher valuation. Our first exited position in the second quarter was DXL Group (DXLG, $100mn market cap), a men’s big-and-tall retailer with approximately 350 store locations nationwide. This niche retailer dominates its segment as it is by far the largest purveyor of plus-size clothing for men in the country and has a track record of fending off both bricks-and-mortar and online competitors. However, the company’s strategy of pivoting from older small-box stores to larger big-box ones—and taking on financial leverage to do so—was poorly timed with a period of unprecedented upheaval in the retail industry. Today the company has $70mn in gross debt (4.5x ebitda) with inconsistent free cash flow. We have been monitoring the company closely for awhile now, and the “final straw” for us was the announcement this quarter that the company’s longtime CEO Dave Levin would be retiring at the end of the year. Given the market cap size of the company today, is financial profile, and management uncertainty, we decided to exit this position. The second exit for us this quarter was Horace Mann Corp (HMN, $1.8bn market cap), a multi-line insurer based in Springfield, Illinois, that sells property, casualty, life, and retirement insurance products to a targeted base of public school teachers around the country. When we initiated our position in Horace Mann at the end of 2013, our basic thesis was that the company’s long history and reputation among teachers gave it a loyalty advantage in marketing to this group of customers that, actuarially speaking, were more attractive than the average insured. Building from this base, new CEO Marita Zuraitis outlined a strategy to modernize the infrastructure and salesforce at the company to mimic the larger insurance operations that she had previously led at Hanover and Travelers. We believed that the stock, trading below book value, did not reflect the value of the company’s customer base or the potential for improvement under a credible new CEO. While much of our thesis has played out as expected over these past five years, and as the company’s valuation, we believe, is more reflective today of these characteristics, there are two reasons that we felt the company might be challenged over the next several years and that its valuation could be at risk. The first is an industrywide trend toward increased losses in personal auto insurance underwriting, driven by a combination of distracted driving, more expensive car designs (and more expensive repairs), and perhaps the ultimate existential threat of autonomous driving. The second and more pointed reason for concern was the lowering of the competitive barriers to entry that historically had surrounded the company’s focus on the educator market. For a variety of reasons, we believe that insurance is becoming increasingly commoditized and impersonal today, particularly in personal lines, and many consumers do not have the loyalty to affinity groups that they used to have, which we believe was a significant contributor to the returns on capital that insurers like Horace Mann were historically able to capture. Faced with these challenges and a fairly-valued stock, we decided that there were better uses of portfolio capital elsewhere. Bloomberg recently reported that the private equity industry, which largely focuses on businesses that would be considered small- or mid-cap companies if they were public, has over $1 trillion of “dry powder” uninvested capital that is waiting to be deployed. Combined with the proliferation of private equity firms and record-high buyout valuations, the competition to deploy this capital is intense. Lower leverage. The average private equity buyout today occurs at 6.4x debt-to-ebitda, one of the highest levels on record. With this level of financial risk, not much has to go wrong operationally before a company’s equity can be severely impaired. The average Russell 2000 company today has leverage of 2.9x and the average company in the Punch Small Cap Strategy has 1.4x leverage. We believe that this financial conservatism creates a risk/return profile that is fundamentally less volatile and increases the odds of surviving and thriving in the next economic cycle. Increased transparency. Public companies in the U.S. are the global standard for disclosure, corporate governance, and regulatory oversight. While several large-scale frauds have occurred in public markets over the past 20 years (Enron, Worldcom, etc. ), it is interesting that one of the largest frauds of recent memory is a private equity-backed company: Theranos, which was exposed in riveting detail in the book Bad Blood by WSJ journalist John Carreyrou. We cannot recommend the book highly enough. Improved liquidity. Continuous liquidity and an active trading market hold important advantages for public market investors, including an ability to manage position sizes, average down on an investment, and enter and exit markets without the commitment of lock-ups or capital calls. The greatest advantage to investing in publicly traded small- and micro-cap equities, we believe, is the opportunity to do original research on under-the-radar companies that may be inefficiently priced because they have been “orphaned” by larger investors, both active and passive. Perversely, the reasons that these companies become orphans in the first place are sometimes positive from an investment perspective: high insider ownership limits public float but increases management alignment with shareholders; high free cash flow generation reduces or eliminates the need for investment banking or sell-side research; CEO’s uninterested in heavily promoting their stock are more focused on operational excellence within their organizations. These are the types of companies and situations we seek and, in today’s market environment, are not having difficulty finding. Punch & Associates Investment Management, Inc. (Punch & Associates) is a registered investment adviser; registration as an investment adviser does not imply a certain level of skill or training. Information presented herein is subject to change without notice and should not be considered as a solicitation to buy or sell any security. Information presented herein incorporate Punch & Associates’ opinions as of the date of this publication, is subject to change without notice and should not be considered as a solicitation to buy or sell any security. Forward-looking statements are subject to numerous assumptions, risks, and uncertainties and actual results may differ materially from those anticipated in forward-looking statements. As a practical matter, no entity is able to accurately and consistently predict future market activities. While efforts are made to ensure information contained herein is accurate, Punch & Associates cannot guarantee the accuracy of all such information presented. Material contained in this publication should not be construed as accounting, legal, or tax advice. Composite performance is shown net-of-fees and brokerage commissions paid by the underlying client accounts. Certain client accounts have directed us to reinvest income and dividends, while others have directed us to not reinvest such earnings. As such, performance data shown includes or excludes the reinvestment of income and dividends as appropriate, depending on whether the account has directed us to reinvest income and dividends. Past performance is no guarantee of future results, and investing in securities may result in a loss of principal. Punch & Associates claims compliance with the Global Investment Performance Standards (GIPS®) and has prepared and presented this report in compliance with the GIPS® standards. Please refer to the attached Composite Profile and Schedule of Performance for information regarding Punch & Associates’ compliance with GIPS® standards. The reference to the top five and bottom five performers within the Punch Small Cap Equity Strategy portfolio is shown to demonstrate the effect of these securities on the strategy’s return during the period identified. The holdings identified do not represent all of the securities purchased, sold or recommended for advisory clients during the period of time shown. Past performance does not guarantee future results; therefore, it should not be assumed that recommendations made in the future will be profitable or will equal the performance of the securities in this list. Please contact Punch & Associates at andy@punchinvest.com or (952)224-4350 to obtain details regarding the calculation’s methodology or to obtain a list showing every holding’s contribution to the overall strategy’s performance during the period of time shown. Company specific information referenced in this commentary is compiled from a variety of sources including SEC filings, quarterly and annual reports, conference calls, conversations with management teams and Bloomberg LP. Any benchmark indices shown are for illustrative and/or comparative purposes and have only been included to show the general trend in the markets in the periods indicated. Such indices have limitations when used for comparison or other purposes because they may have volatility, credit, or other material characteristics (such as number and types of securities or instruments represented) that are different from those of the Composite and/or any client account, and they do not reflect the Composite investment strategy or any other investment strategies generally employed by Punch & Associates. For example, the Composite for a particular client investment portfolio will generally hold substantially fewer securities than are contained in a particular index. *Inception of the Punch Small Cap Equity Strategy was March 31, 2002. **CTR represents the contribution to total attribution.